Life is different for everyone. We may be sharing the same planet but living in different worlds. What causes us to have all these different varieties of lives, looks, and even different feelings, perceptions and views towards all phenomena? I guess it’s all because of different Karma we create in our day-to-day life. Where we live, what we do, how we feel, what we have, what we know, where we go, all these came from our karmic connection. Doesn’t matter which corner of this world you are living in if you have karmic connections. You will keep in touch or work together with connected people in many ways. Benny and LieLy are a Buddhist couple who live in Indonesia, I am sure there is a very auspicious karmic connection with us. 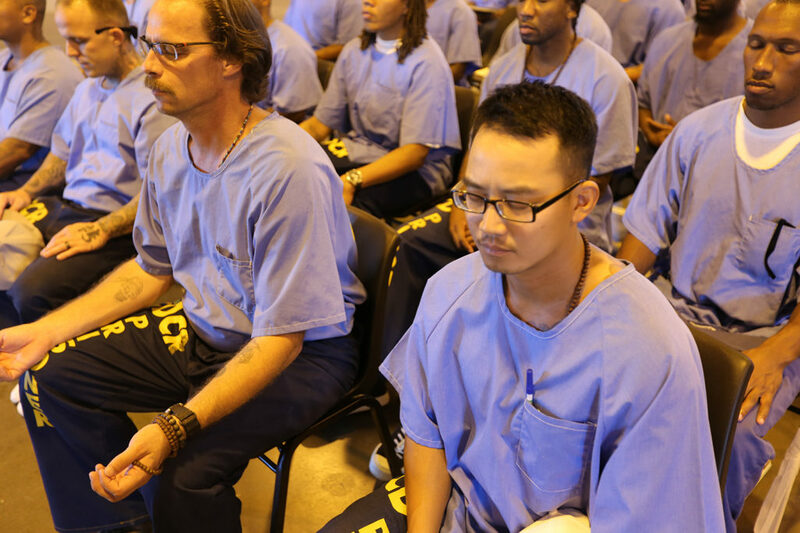 Around 5-6 years ago, during our fist meeting in Los Angeles, I introduced them to the IBS in USA, and the work in propagating Buddha Dharma in many state prisons in California. Since then this couple has been supporting IBS Prison Program in many ways. On behalf of Iron Temple Sangha, I would like to thank them for their support. Early this year Benny again asked me to apply for prison gate clearance for his wife, his son and himself. 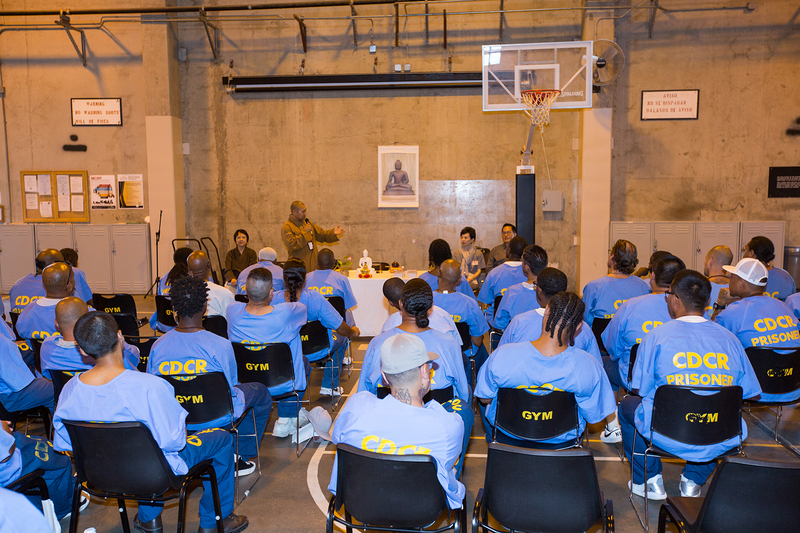 I was so happy that they not only support our program but also wanted to visit the Buddhist brothers in prisons. I applied for three different institutions in California. We only got the clearance for one prison, which was Wasco State Prison. I would like to say thanks to Mrs. Sabrina Lynch, the Community Resource Manager (CRM) of Wasco State Prison, for her kind help with the gate clearances. It was 9am in the morning when we got to the Wasco State Prison. We went to CRM office to meet Sabrina and she escorted us in to the Institution. Usually we meet in the chapel, but this time she arranged us to meet in the gym because there were more than 70 people signed in for the class. 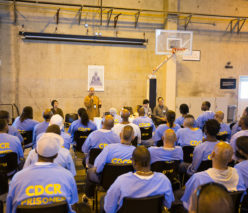 When we got in the prison, some of the brothers were already released from the program. We went into the gym and started to setup the altar for the service. At the same time many brothers came in and helped us arrange the chairs and PA system. Because it was right after the 4th of July, there was a shortage of officers in the yard. Therefore there was a delay to get every brother on time for the service. After a Q&A session around 9:45am we started our service. First we introduced our guests Mr. and Mrs. Luhur to the Sangha. Brothers were so happy to know that they have been supporting the IBS Prison Program for a long time. I can tell their faces were full of happiness. I understand that why they have such a happy feeling because whatever they are learning and getting benefits, they are from these kind people. Meditation and the Buddhist education program are really helping them relieve stress and enhance their spiritual practice. During our service, we had a Dharma talk, meditation, and Q&A. At the end, Benny and LieLy presented them with gifts of book for all the brothers who participated in the program. Even though it was a little hot and noisy in the gym, we enjoyed the service with our guests and brothers. 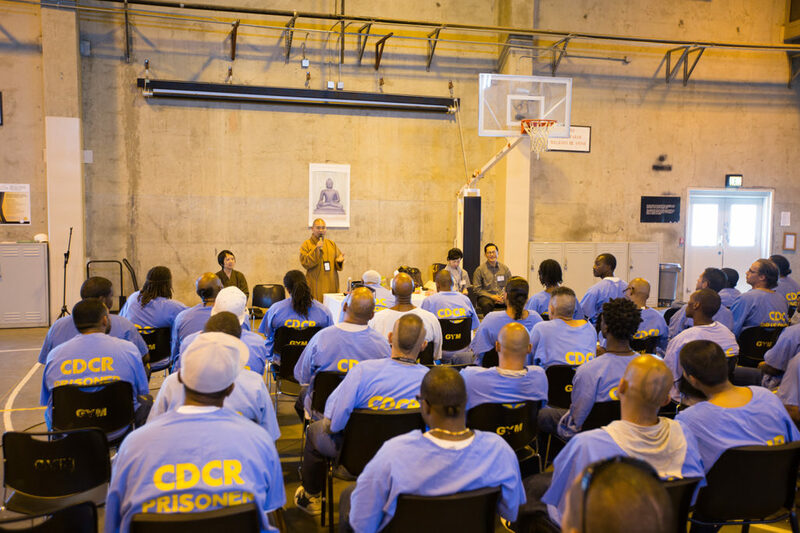 This was not the first visit to prison for Benny, so he know what the prison looks like but it was first visit for LieLy to the California Department of Correction and Rehabilitation. I was so eager to hear from LieLy’s experience after visiting this prison. Right after we came out from the prison. I asked LieLy, “What did you experience visiting these brothers”? She said, “It is hard to tell that these people committed crimes, they look like normal people on the street. It was a completely different experience than what I expected.” I was happy to hear such positive feedback from LieLy. Yes, that is true that these brothers are normal people like us. But when negative karma dominates us, we act abnormal. Once I said, “THERE ARE NO BAD PEOPLE IN THIS WORLD, BUT THERE ARE PEOPLE WHO MAKE MISTAKES OUT OF IGNORANCE.” When the condition is there, our karma compels us to act in certain way. May all sentient beings be free from suffering and causes of suffering.